Last week we saw all the various Tim Burton movies has created with the one of a kind characters created. 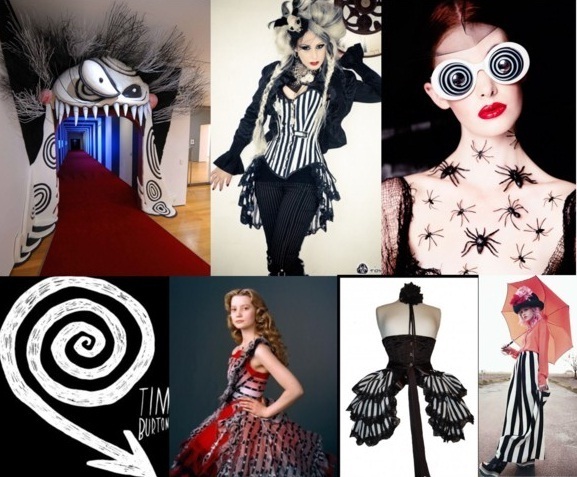 Check out these Tim Burton inspired fashion styles to help spruce up your wardrobe with amazing styles. Here are 4 style tips we can emulate and stand apart from the crowd. Most of Burton’s work is either dark with prominent colors like black, white and red. The clothing styles vary from modern to contemporary with a touch of victorian, retro, medieval and Gothic fashion. The film Frankenweenie opened up the BFI London festival where models strutted on the red carpet wearing black and white ensembles, mulberry-oxblood lips, dark hair, black and white spiral eyewears, black wedge shoes and two dogs that looks like Sparky. 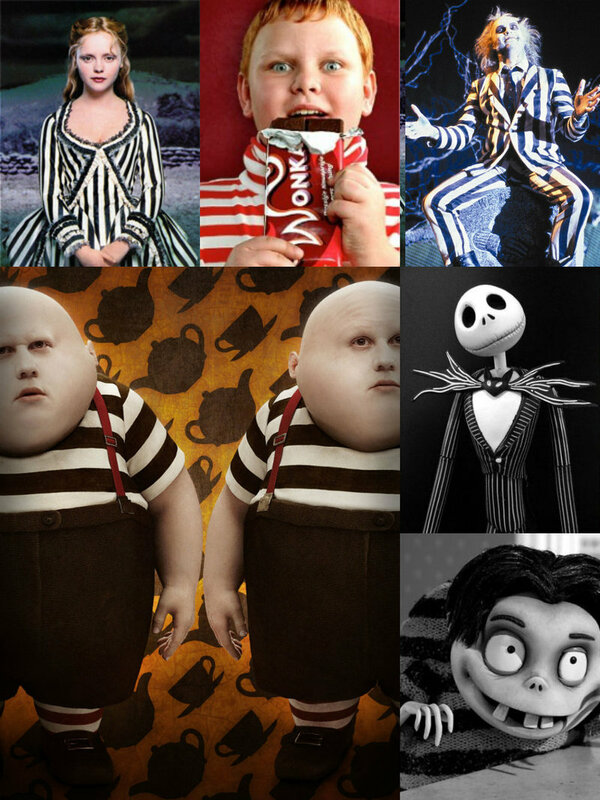 Black and white stripes were seen worn by characters like Jack Skellington’s suit from The Nightmare before Christmas, Katrina Van Tassel from Sleepy Hollow, Beetlejuice’s suit, and E-gore from Frankenweenie. Red and white stripes from Augustus Gloop from Charlie and the chocolate factory and another stripes from Bob from Frankenweenie. Don’t forget Tweedle Dee and Tweedle Dum! Incorporate dark ensembles with modern Gothic, Victorian and Steampunk fashion inspirations. Make a twist for styles off characters like Mad Hatter, Victor, Ichabod Crane, Sweeney Todd and Barnabas Collins using Steampunk inspired hats, canes and accessories. Pull out Mrs. Lovetts, Red Queen and White Queen styles using gothic corsets, laces, gloves and accentuate it with skulls, skeletons, hats, canes and flower headbands. Skip contouring and highlighting and even bronzing out your face. Go Goth and use a foundation lighter than your skin tone. Grab a raspberry color or brown palettes and create smokey eyes concentrating on your eyelids and eye bags, it doesn’t matter if they’re messy. Go for dark lips. Black or plum colors that screams cyanosis. Movies always help us escape and we are eternally grateful to the Tim Burton franchises for helping us do so, and expand the horizons of our imaginations. Our collection of items you can find on RebelsMarket can help you fulfill these style tips to stay ahead of the pack. Share with us some Tim Burton fashion tips you could have picked up from his films as well. If you have pictures of them, attach to your comment below.